Hello. It's good to be back. Everything has more or less returned to normal. My 81 year old Mum has settled into her new house and it's looking good. The only thing that's not been sorted is her telephone - and all I'm saying is never...ever...get your phone from the Post Office - dreadful service. But, hey ho of all the things that could have gone wrong, I suppose we were let off lightly. it's time for another Papertake Weekly Challenge. For my card I used little Penny Black Robin stamps which I watercoloured. The sentiment stamp is by Hero Arts and I gave it a blast of the old Frantage. OK then, that's it from me today. I have loads of catching up to do in blogland. Can't wait to see what you have all been up to! Hi Liz, great to see you back hun, glad things are almost sorted. LOVE the gorgeous card, fab design & very cute robins. Great to see you back Liz and with such a fabulous card - uber cute!!! Good hear your Mum is settling in. Welcome back Liz, I'm glad your mum's move went well and she is settled into her new home. 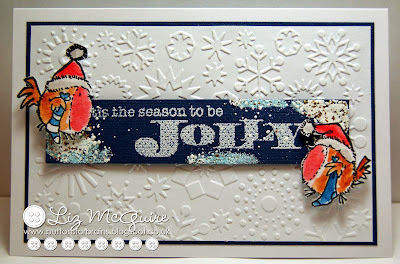 Your card is gorgeous, such adorable robins and I love the embossing.